Don Leady, a founding member of Austin, Texas’s Leroi Brothers, may be best known for his next gig, as front man for the roots-rocking trio The Tail Gators. The original Tail Gators–Leady, Gary “Mud Cat” Smith (drums), and the legendary Keith Ferguson (electric bass)–served up an incredible, one-of-a-kind mish-mash of blues, surf, Cajun, country, Tex-Mex, soul, and rockabilly (among other flavors), and were the band to beat for low-down Americana. It’s been more than a decade and a half since the Tail Gators waxed their seventh and last long-player, It’s A Hog Groove, in 1996, so what a delight it was to discover Don Leady’s new Facebook page and to learn that he has just issued a solo CD to satisfy our cravings for dirty guitar instrumentals. At just under half an hour’s running time, the appropriately-titled Hillbilly Boogie Surfin’ Blues is short but ever so sweet. Backed alternately by Art Kidd and Nico on drums, and playing all the guitar and bass parts himself, Leady picks up where he left off with the Tail Gators, laying down a dozen cuts of prime–and primal–roots music. An instrumental trio more than suffices; Leady, a modern-day Don Rich, never even breaks out his fiddle, instead choosing to draw on a dizzying palette of picking and stylistic approaches on his guitar, and to employ a range of across-the-board great tones. There’s nothing here not to like. The set opens with the charging “Bull Doggin’ Boogie.” Also on the country side of things are “Ice Cream Star,” a fast instrumental of Albert Lee-like precision with a basic boogie section in the middle to cool things down a bit, and the hammer-and-pull-a-thon “Hillbilly Blues,” in which Leady dials in a tone of steel guitar-like clarity. “Thunder And Lightning,” which closes the album, comes out of the same acrobatic bag. The mid-tempo “Texas Dance Hall Blues” splits the difference between country and blues with panache, and delivers a few off-the-wall surprises worthy of the old Speedy West and Jimmy Bryant sides. If you yearn for pure blues, check out Leady’s cover of the Lightnin’ Hopkins chestnut “Lightnin’s Boogie”; his swinging “Fat Wolf Blues,” with its “Dust My Broom” quotation, tricky syncopations, and high-wire soloing; and the wonderfully wobbly “Slo Bo,” which plays expertly with some of Bo Diddley’s patented Latin-influenced rhythms (but not his famed hambone beat) and tricky chordal lead work. Leady has a knack for creating moods that are almost tangible. The swamp pop confection “Louisiana Feeling” is achingly, last-dance sweet. Check out Leady’s (reverb) tanked-up frolic, “Echo Surf Boogie,” with its nods to both the California-bred surf styles and to the UK guitar hero Hank Marvin, or his tom tom-driven tribute to the garage rockin’ master, Link Wray, in “Crazy Link.” The Western epic “Ride Of The Ruthless,” originally recorded for the Big Guitars From Texas compilation back in the day, is practically cinematic in its drama and immediacy. Talk of the Big Guitars series brings to mind a fitting description for Leady’s music: Trash, Twang, and Thunder. If you were a Tail Gators fan back in the day, I suspect you stopped reading some time ago, for at least long enough to track down and order a copy of Hillbilly Boogie Surfin’ Blues. 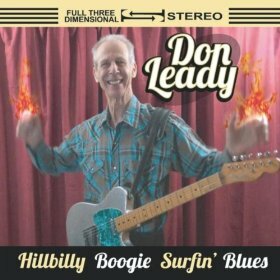 If you are new to the guitar stylings of Don Leady, I can make only this recommendation: Get it if you ain’t got it! It is pure dynamite.